Catax are the largest taxi company in the local area with a fleet of over 40 vehicles.We use the lastest technology to provide our customers with the most efficient and reliable service available. All the taxis are licensed by Tandridge District Council. Drivers undergo enhanced level Criminal Record Bureau checks, have regular medicals, and their standard of driving tested. Checks relating to local knowledge are also made. Catax has several different types of vehicle, ranging from ordinary saloon cars to 8 Seater Minibuses. All are fitted with taxi meters which are calibrated and checked to ensure that the cost per mile is standard throughout our fleet. 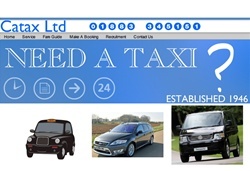 We are members of the Tandridge Taxi Voucher Scheme.